Oh man, I have been a lame mom lately. My kids have been begging for activities to do after school and projects and I have not had the energy or enthusiasm to do anything after being sick with a super lame cold last week. We've basically stuck to my 5 Things I Do Every Day With My Toddler list and have maybe done one of them per day. Today we pulled out some animal flashcards that my toddler found in a cupboard and then we saw some library card pockets and VOILA! we had a much better activity than sitting around arguing about Magformers (which by the way happens every day lately... we need MORE). 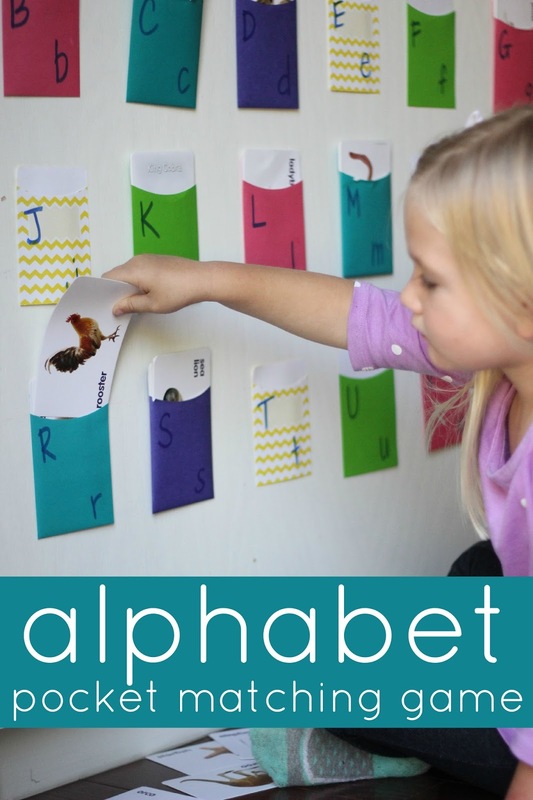 This Alphabet Pocket Matching Game was designed for my preschooler, but my toddler and first grader joined in too! Soon enough no one was arguing any more! Hooray! Once you've gotten yourself together start by prepping your pockets. 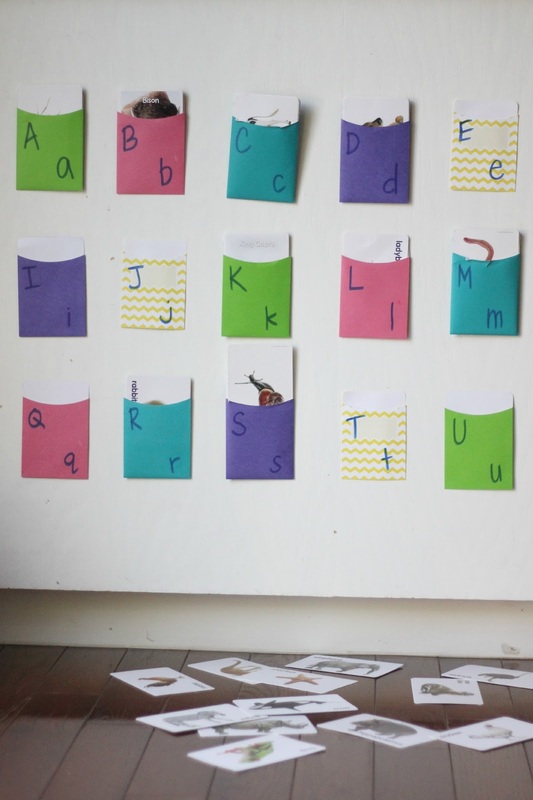 Write an alphabet letter on each pocket A-Z. I wrote lowercase and capital letters on each pocket solely because some of our flashcards had words that were capitalized and some were lowercase. Being able to see both helped my daughter matching the beginning letters easier. Next stick the pockets onto a wall using painters tape. I used painters tape so it doesn't ruin our walls. Once all of your materials are set up you are ready for matching!! We played the game by matching beginning letters of the animal names with the pocket alphabet letters. You could easily adjust that for older kids and do middle letters or ending letters. My preschooler chose an animal card and looked at the name on the card. She then read the beginning letter name and matched the card to the correct pocket with that same alphabet letter on it. Once she matched the card then she stuck the animal card inside the correct pocket and then moved onto another one. Make sure that your flashcards are thin enough to fit in the pockets! if not, trim the sides down before you start playing! My toddler joined along with this activity though he just had fun putting the cards in any pocket. We tried looking at letters a bit and he was able to match a few beginning letters, but only with the alphabet letters he knew really well. We love library card pockets and created a cool number pocket game for toddlers and preschoolers that you might also enjoy! Do you have any other favorite ways you use library pockets to play, create, or learn? We'd love to hear about them! Where did you find the card pockets? Hi Jessica- I found mine at JoAnn Crafts. I linked to car pockets in the blog post as well that you can purchase on Amazon if you don't have a JoAnns or other craft store nearby.